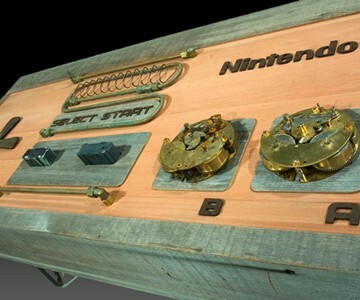 The steampunk Nintendo controller coffee table isn't fully-functional like other versions of Charles Lushear's take on the iconic gaming system, but on the bright side, this means it is less likely to get broken during heated, fist-pounding sessions of Zelda and Mike Tyson's Punch-Out. Still equally likely to get broken when I tackle the Fireball solo...or accidentally trip on the air while sober...and fall on its glass top though. Functionality and fragility aside, Lushear's latest NES table sets itself apart from all others most markedly with its terrific steampunk aesthetic. 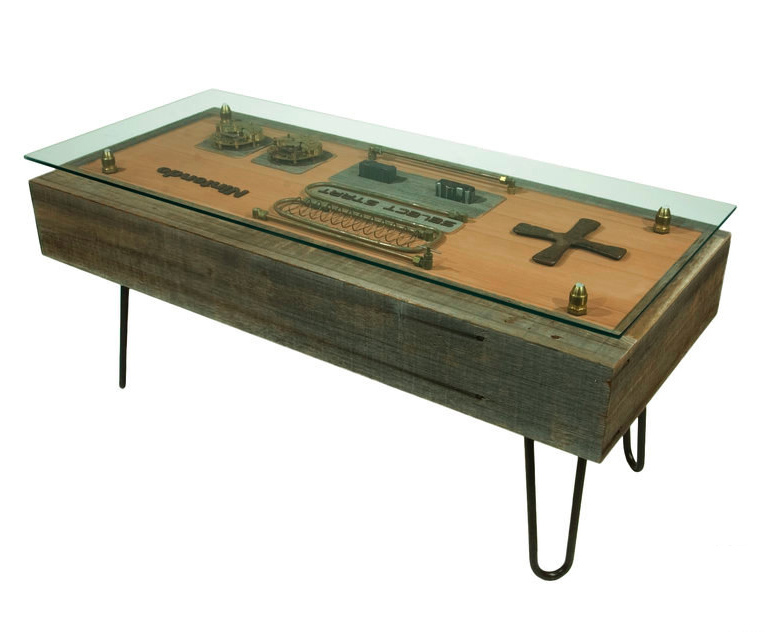 Made entirely of reclaimed materials, the piece is just as classy as it is kitschy, and as current as it is nostalgic. Well I think so anyway. But maybe that's just because I like things that make me feel like it's OK to play video games all day in my pajamas with an Ampratite Plasma Pistol in my lap. Frame/Top: Cedar wood that was formerly a fence. It was found on the side of the road in Marina Del Rey, California with a harnessed baby dangling from it. Directional Pad: A Katanga cross. Also called a handa, the parent piece is a cast copper cross used as a form of currency in parts of what is now the Democratic Republic of the Congo during the 19th and early 20th centuries. At that time, a Katanga cross would buy about 22 pounds of flour, 5 or 6 chickens, or 6 axes. Two would buy a gun. 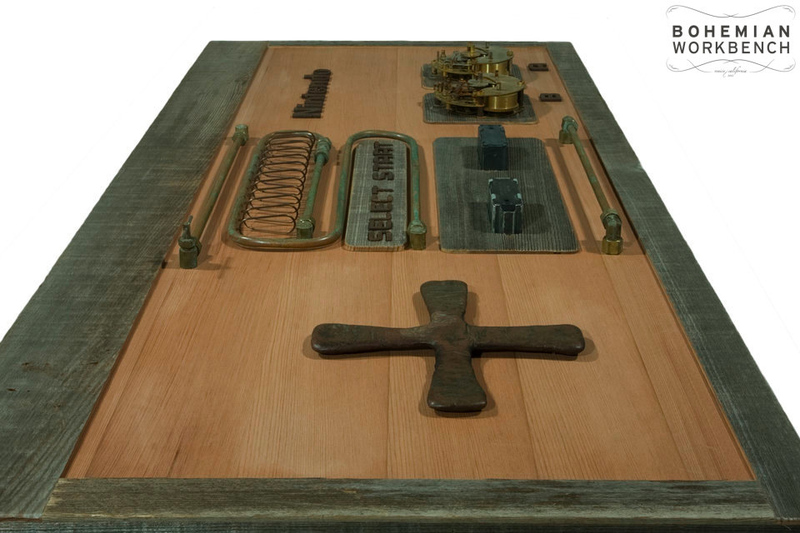 A/B Buttons: Exposed antique clock movements. 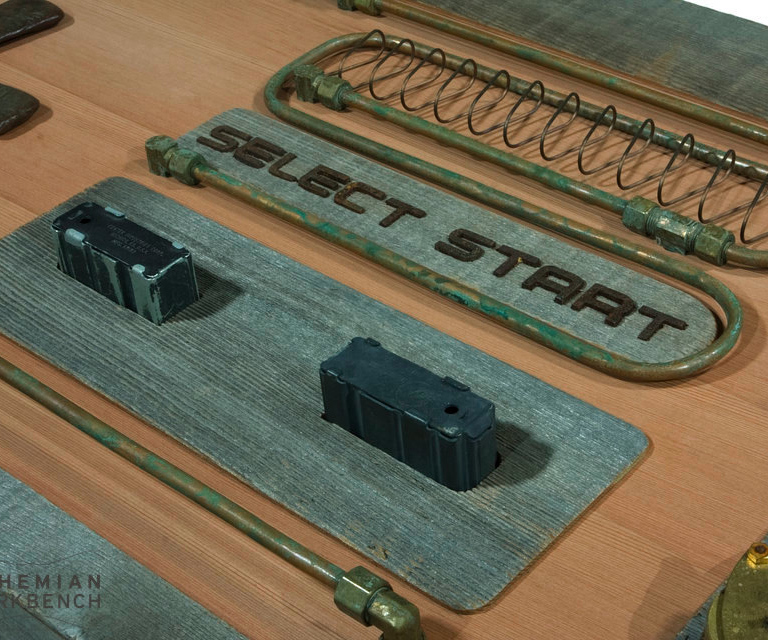 Start/Select Buttons: Vintage AR-15, 20-round magazines/clips. Legs: Aged 1/2" steel hairpins. Table dimensions are 40" long x 17-1/2" wide x 18" tall.